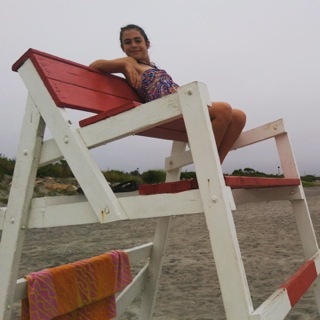 After dinner, I climb the splintered rungs of a lifeguard chair with my daughter along a misty beach in Narraganset, Rhode Island. The rest of my family had taken refuge from the darkening skies in our cozy cottage rental. My ten-year-old and I are intrigued by the drama of the slate sky and the even roar of waves upon a deserted coastline. We snap a selfie and she sprints toward the water giggling and frolicking in her own introverted ocean festival. I watch her dance in the spray with a tangle of salty hair still knotted from a day of beach life. In my mind, she’s a little girl. She still holds my hand as she did when she was a toddler, but not as often now (she reminds me that she is technically a tween). This is just the way I want everything. I am happy. When you can feel any and every feeling, then you are free. We suffer to the degree that we resist whatever sensations or feelings that are emerging. There are no difficult situations or difficult people; there are only emotions that we resist. We spend precious life energy trying to control life and others so we might avoid certain emotional states. All control is based on fear. We try to control things because we are fearful of what we might feel if things don’t go according to plan. We fear because we want some things and because we don’t want other things. Mindfulness meets us precisely in this human condition—within the frustrating cycle of having what we don’t want or wanting what we don’t have. Mindfulness is a practice of intimacy with your direct experience and with life itself. There is no need to run away. There is no need to avoid or to cling. With some training, we can learn, more and more, to ‘be with’ any and every feeling without running away. We can ‘be with’ a five-mile traffic backup. We can ‘be with’ a relationship that is not going the way we would like. We can ‘be with’ sickness or pain. We can learn to ‘be with’ that thing that wakes us up at 3 am. This ‘being with’ is mindfulness. Mindfulness is not esoteric or otherworldly. Mindfulness is the most ordinary thing there is—it’s hanging out with life the way it is. Welcoming everything doesn’t mean accepting injustice or violence. It’s not a convenient excuse to remain passive or to be silent amid all that threatens human flourishing. Rather, this kind of stability and freedom to ‘be with’ the full range of human experience allows us to be grounded and radiantly compassionate as ignorance, hatred and division rage in our world and at our dinner tables. The perennial wisdom of mindfulness practice is that presence itself is healing. The courageous capacity to feel everything and anything is our enduring gift to the world. This welcoming presence makes fierce love and tender compassion possible. A few weeks after my poignant moment at the beach, my daughter and I were telling bedtime stories to one another during the kind of late summer evening when we can talk for hours without any worry of waking early for school. Our story time was shattered by her sister’s shrieks from the next room continuing an earlier searing argument about a lost hairbrush (hair is serious business in our house). Looking for a way to convince my daughter to remain unaffected by the taunts of her sister, I remembered the image from our summer vacation. “Be the wave,” I said, as I steadied myself for an epic Zen-master dad moment. This is the kind of moment that every dad awaits when he imparts earth-shattering wisdom upon his blank slate of a child which will be treasured and recalled at his deathbed. She interrupted my sermon after three words. In sleepy nonchalance, she spoke out into the darkness, “The water doesn’t say to the wave, ‘I won’t allow you through. I don’t want you—you are too strong or too big or too unpleasant.’ The water doesn’t argue with the wave. The water simply lets the wave pass through it without getting upset about it.” She didn’t need me to teach her this wisdom. My daughter simply needed the space to realize it for herself. And in that moment, I remembered that the irrefutable sign that you are not a Zen master is that you think of yourself as a Zen master. Rather than battle through a wall, she mindfully chose to be water and to allow the sonic energy and emotional charge of her sister flow right through her. When drops welcome the flow of water, they become a wave. When a shoreline welcomes every wave, it becomes a beach—a haven for play, ease and rest. When a person welcomes each moment as it is, she becomes a channel of peace. I see clearly that the day will come when my daughter’s wisdom eclipses my own. I feel a surge of emotion. What else could I ever wish for? In silence, below the canopy that a 30-something dad made for his little girl so many years before, we lay like a beach while her sister’s grievances barked through the plaster. The hardwood shook and the decibels crashed upon our shores for awhile. At my side, my daughter knew there was no need to fight or resist. Yelling at someone for yelling at you only creates more yelling. Instead, she was content to be the beach giggling at the foam undisturbed by the rising tide. Her equanimity and willingness to ‘be with’ what is happening without fighting or fleeing is the work of mindfulness. Even a sister screaming over a missing hairbrush could be welcomed. This is why I practice mindfulness. One of the most important roles we have as parents is to teach wisdom. Yet wisdom isn’t passed along like a toasted-everything bagel ripped in half and shared at the breakfast table. Wisdom isn’t given or downloaded as an accumulation of facts passed from one mind to another. More information will not lead to transformation. True wisdom is embodied; it’s what happens when we stop fighting and learn to merge with the way things are. Wisdom is the freedom we experience when we recognize that we have the ability to feel everything and anything. Therefore, the best lessons we can teach our children are not the one’s we teach them, but the ones we witness and celebrate when they learn them on their own. For the moment, I’m incredibly honored and grateful to be my daughter’s teacher until the day she realizes she doesn’t need one.